How am I different? Why should anyone choose my business? What do I offer that is unique or special? These are some of the most difficult questions for entrepreneurs to answer. But in this age of unlimited consumer choice, the answers to these questions are what makes one brand successful and dooms another to failure. Brand identity is much more than a description of products and services. Thousands of retailers offer similar stuff, but the pricing, customer service, physical environment and marketing completely differentiate them in the minds of consumers. How many stores sell blue sweaters? You’ll find them at Saks Fifth Avenue, Forever 21 and Old Navy, but you probably won't find the same customers at those stores — these businesses have differentiated their brands to respond to the psychological needs of different groups. Every entrepreneur must do the same. The sweaters may be slightly different — the fabrics won’t be the same and they may be cut differently — but the products are fundamentally identical. It is not the product but rather the value created in the mind by the brand that allows Saks to charge ten times more than Old Navy for a similar product. To build a successful brand you must be willing to set your business apart. But this can be hard to do because we examine our businesses through our personal, human ideas of popularity — we want to belong to groups and teams. As kids we become fearful of setting ourselves apart; after all, sometimes “different” means “strange” and it can be easy to ridicule someone who is unusual. But a business is not a person, and we can’t let the fear of standing out from the crowd affect how we create a brand. Calling attention to your business is the only way that customers understand what you have to offer, and differentiating yourself from the competition is the best way to build a customer base in this age of innumerable brands. So we’re back to the basic question: What makes your company unique? Why should I do business with you? When it's time for you to claim your own patch of ground in the public mind, there are a few avenues you can pursue that make this process easier. One way to differentiate your business is by telling a unique story. If your company has a story to tell it will most likely be completely different from any other. Some entrepreneurs have taken their personal histories and made them into brands. Others use the product itself as a kind of story. Does your company have a story to tell? What’s the best way to tell it? Some brands create distinctive rituals. The way you use a product can become very ritualized; the steps we take as we eat, dress and care for ourselves are good examples. Some companies have taken the idea of ritual a step further and created habits that keep customers coming back for more. Is there a ritual hiding in your company that can become the face of your brand? Can your brand establish a new community? Some brands are so unique that they inspire followers who become far more than customers — they become advocates for products and services as they align their own identities with the brand. Can your brand become a banner that leads your customers? 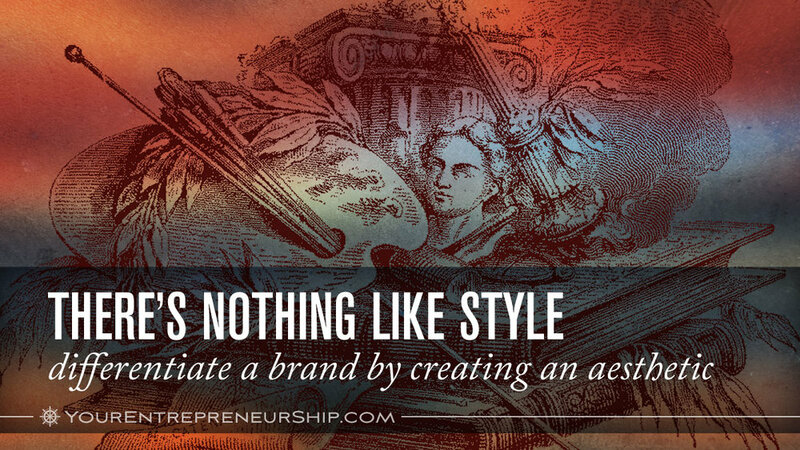 Brands can create styles all their own. A company can develop a unique aesthetic that takes up residence in the mind. Even products that you might think of as commonplace can transform themselves with a touch of style. Look around your home — does your furniture look like it came from a particular store? When you go into your closet, is it easy to tell what designers you favor? These brands have chosen a particular style that appealed to you, and any company can do the same. We have become consumers of experiences. As commerce has grown and evolved we have taken the most mundane activities and transformed them into unique experiences that can easily create a new brand in the mind. Restaurants have turned eating into theater, and movie theaters have turned entertainment into a culinary experience. Even visiting the dentist has become more like a day at the spa. Can your products and services create a memorable moment? Do you turn heads when you walk into a room? Does your own personality deserve a brand? If your reputation precedes you, it may be that the best way to define your brand is through yourself. Many brands have done this over the years and, although it can be tricky, sometimes the most effective brand is the face of the founder. Other brands choose characters — both fictional and real — to distinguish their brands. Regardless of who you choose, adopting a personality for your brand can be an effective way of drawing a distinction between you and your competition. All teams share the same basic dynamics, no matter what kind of team it is; a football team functions the same way a choir does. Each person on the team has a specific role. Duties are assigned and are expected to be performed, whether you serve the team as a defensive tackle or the lead alto. When you join a team you wear the team uniform — a football jersey or choir robes. The team finds ways to set itself apart from other teams that do the same thing. A team usually has a name — the Dallas Cowboys or the Mormon Tabernacle Choir. Members also work together to achieve a common goal: winning as many games as possible during the season or putting out a Christmas album. These three elements — role, identification and purpose — form the basic process of building any community, including a community that supports a particular brand. People may come together to support a political candidate, raise funds for a nonprofit committee, or dress up for a comic book convention, but the dynamics of the process remain the same. If you choose to create a community around your brand, you need to understand and facilitate these same processes. What role is assigned a member of the community? Early adopter? Advocate? Are some roles reserved for participants who are more committed or who have demonstrated greater loyalty? How can I facilitate these roles? How do members of the community identify themselves? How can they set themselves apart? What can they do to show others that they are part of the community? Do they have a name (Swifties, sneakerheads)? What purpose does the community serve? What goals make them want to get involved? How can they show others that they’ve reached those goals? Does the community serve a larger purpose, such as supporting a philanthropic cause? Nonprofits have developing devoted followings engaged in all sorts of activities that attract both attention and funds. One of the most successful recent case studies is the ALS ice bucket challenge. The identity: People who participated aligned themselves with this campaign, posting more than a million videos to Facebook and other social media. They identified themselves as members of the group by performing the role and sharing the proof. The goal: The campaign raised money and awareness to help those dealing with ALS. This viral sensation created an online community of participants who raised more than 100 million dollars and contributed to dramatically increased awareness of Lou Gehrig's disease. Communities and identities are fluid. Some brand communities are temporary while others may last for decades. But as we see from this example, even a short-term community can have a tremendous impact on the long-term success of a brand. One notable for-profit example is the community developed by Harley-Davidson, the Harley Owners Group. This community of more than a million motorcycle enthusiasts can be found all over the world. A range of roles have developed, with subgroups for women and veterans. Members get together to take trips, attend events and share their love of bike riding. The company provides hundreds of ways for them to identify themselves with branded merchandise. Although the primary purpose is recreational, the brand has established a secondary purpose by supporting the Muscular Dystrophy Association. Book clubs meet regularly all over the world. There are clubs that read romance novels and science-fiction, clubs that review new works of poetry and clubs focused on the latest political books. But Brenda wanted to create something completely new to support her fledgling book store. Taking cues from the enormous success of the Harry Potter books and the large parties that were held on release dates, Brenda decided to create a book club that engaged people in diverse ways. She assigned new works and established roles for members who wanted to volunteer. Each month, the "bookworms" would produce an over-the-top event for a much wider audience. One month, Brenda's Bookworms decided to create an event based on the Little House on the Prairie series by Laura Ingalls Wilder. They produced marketing materials and spread the word on social media. The Bookworms chose roles and began preparing for "Prairie Day" — a full day's worth of lectures, demonstrations and stories for historians young and old. Members who like to cook agreed to produce dishes authentic to the period and set up a buffet. As they served guests, they described how each dish had to be made from ingredients that were grown and gathered by the same people who ate the meal. Brenda recruited history enthusiasts from a nearby historical society who brought household objects that would have been used by the family and described how covered wagons would be loaded with everything that could be needed on a long, cross-country journey. A cartographer was asked to do a presentation showing the routes used by people migrating across the country in the 1800s. Several women agreed to dress up like the main characters and present period clothing, demonstrating how impractical it could be when dealing with the realities of life in a covered wagon. Brenda also brought in an expert from a local sporting goods store to show how much footwear and rugged clothing has changed since then. A local preacher came in to describe the central place of religion in 1800s society. The next month, the Bookworms got together to provide an evening featuring "The Society of Dead Poets." Each member chose a favorite poet, then studied the works and life of the chosen author. A public event was held at the end of the month where each member dressed as a poet and, sitting on a small stage, read some favorite poems and answered questions from the audience. Audience members had the opportunity to pose questions to a demure young woman by the name of Emily Dickinson. A grizzled, old Walt Whitman read "Song of Myself" and talked about how affected he was by the Civil War. Membership in Brenda's Bookworms became rather prestigious, and was limited to those who were interested in investing time and energy into putting on these monthly events. But there was plenty of enthusiastic support within the community, and lots of interest from local schools. All of this helped Brenda create a unique brand that the mass-market and online bookstores could not compete with. Most brands create some aesthetic appeal. The logo and brand identity demonstrate a point of view that can be hip or serious or fun — it provides a glimpse into the psychological position that the brand is attempting to develop. But many companies take this much further. An aesthetic can set a brand apart and give it a unique voice. OXO has designed a wide range of household products that adhere to usability principles. Everything from cheese graters to spatulas has been rethought in the most meticulous fashion, creating entirely new designs for very old tools and maintaining a simple, elegant appearance. We are surrounded by technology, but Apple's unique aesthetic sets its products apart. Their clean, accessible designs are the hallmark of a brand that marries usability and aesthetics. IKEA furniture is distinctly styled. The simple aesthetic and customizable function enable their furniture to fit easily into almost any space. Small businesses can do the same. When an entrepreneur goes out of her way to develop a unique aesthetic, the brand is more easily remembered. It doesn't have to be visual — a specific fragrance or flavor can be associated with a particular brand, like Chanel No. 5 or Hershey's chocolate. Where do you go to get a special dessert? Ice cream shops are ubiquitous. Even most fast food chains offer some form of dessert. But where do you go to get something special to top off a wonderful meal or add to a romantic evening? Sara wanted to create a boutique restaurant for just such occasions — an ice cream parlor for adults. She also wanted to include a full bar with specialized drinks designed to entice the senses and add a more aesthetic experience to cocktails. She decided to marry the visual, the olfactory and the gustatory by building a sweet salon for art lovers. Her dessert menu was presented as a gallery — a feast for the eyes and the palate. By combining elements of sculpture with the finest ingredients, her brand of desserts and drinks created an entirely new niche in the minds of her customers. The rich yet distinctly modern interior design was festooned with art. Paintings and sculptures created the feeling of being in a gallery. She took advantage of a local artwork loan program to create a rotating exhibition of the best modern pieces. The desserts were all associated with a particular artist and a work of sculpture. Chefs, inspired by individual pieces and using ingredients sourced from the native land of these sculptors, developed desserts as an homage to a single work of art. Each dessert was named for the sculptor that inspired its creation. The Bird In Space series by Constantin Brâncuși inspired a tall, slender molded sugar glass that, when cut open, pours a raspberry-flavored liqueur (Zmeurată) over a dish of rich vanilla ice cream. Umberto Boccioni’s futurist sculptures inspired a tower of individually molded chocolates filled with almond, coffee and hazelnut creams covered in thin gold leaf. Chihuly glass sculptures inspired a gathering of boldly colored abstract gelatin figures featuring dozens of strong, exotic fruit and vegetable flavors. An extensive liqueur and coffee menu complimented the desserts, providing plenty of reasons to linger for an hour or two. Wait staff was routinely given extensive education on the artworks and desserts to enable them to answer any questions posed by guests. Live musicians were hired to play chamber music on the weekends, adding an audible aesthetic to the visual display. Sara marketed her restaurant by supporting museums and advertising at local galleries. Does your reputation preceded you? Do people turn to look when you enter a room? You may be able to differentiate your brand by becoming its public face. Every celebrity has a personal brand. If an actress builds a great brand, her appearance in a feature film may increase ticket sales. Singers sell albums by marketing their personas, and a popular writer can sell books on the strength of his name alone. But artists aren't the only ones with personal brands. Martha Stewart and Rachel Ray have added their personalities to thousands of household items, from latex paint to kitchen utensils. Bill Gates and Steve Jobs lent their personal brands to the companies they built. People have a hard time connecting with corporations, but they can, and do, feel connected to the real people that lead those businesses. But if you don't want to be the public face of your brand, you can still use this approach — a fictional character can do the same job. Betty Crocker, an invented woman, has been invited into American kitchens for almost a century. A cartoon mouse serves as the brand of the world’s most visited theme parks. A clown represents the world’s largest chain of hamburger restaurants. Even a fictional personality can make a brand more accessible and less abstract. A personal approach to brand differentiation can make it easier for consumers to relate to what you sell, and can create a clear point of differentiation between your company and all the rest. Gene realized that four characteristics describe everything we eat. Foods range in nutritional value from healthy produce to the empty calories of candy and soda. Some foods provide great flavor, others don’t. Some, in their natural state, need no enhancement (fresh fruit) while others don’t taste too good on their own (raw potatoes or flour). Food comes ready to eat, like ice cream or potato chips, or in a state that requires preparation, like raw meat. And, of course, foods come a wide range of prices, from inexpensive uncooked beans and pasta to spices that cost hundreds of dollars per pound. Gene wanted to incorporate personalities into his brand, but rather than have one face for dairy and another for meat, Gene decided to brand his store using these four characteristics. He recruited four different professionals to serve as the faces of these four factors. Together, these characters could tell a "grocery story" instead of just marketing a grocery store. These four professionals worked as a team, but each offered a unique perspective. Nick was in charge of nutrition. He showed customers how to extract the highest nutritional value from the foods they bought, using proper preparation methods and storage. He was in charge of educating customers about specific diets and offering low-salt or low-sugar options to shoppers that need to adhere to specific guidelines. He also educated customers on how to balance not-so-healthy choices with the delicious things we crave like desserts and salty snacks. Cost was Carl’s domain. All customers worry about getting good value from their grocery dollars. If we spend a lot on an item, we need to know that it will deliver exceptional quality. We want to understand how to choose the best and the right ways to store food to keep it fresh. Carl gave customers information on all these topics. He helped them find the best deals on seasonal produce while also showing how a few high-end products, like rare olive oils or cheeses, could turn simple ingredients into show-stopping meals. Frannie was the ambassador of flavor. She taught customers how to draw the best flavor from an onion through caramelizing over slow heat or how to add herbs during the last few minutes of cooking to draw out the aromatic oils without overheating them. She could explain how to use specific vinegars or what apples work best in different dishes. She was also the queen of the spice rack, explaining what to use, how much to use and why — a difficult challenge for all but the most experienced cooks. Preparation was Paula’s purview. She showed customers how to cut down cooking time or take simple steps that saved hours of prep. She was also in charge of demonstrating how to use the many tools that Gene sold. Many customers didn’t understand how to use chocolate shavers or deep-fat thermometers, and learning how to employ the right tools saved time and money while helping customers feel less afraid of trying new things. Gene used these personalities in every facet of his branding programs. He set up an in-store “studio” where his experts could do demonstrations, talk to customers about various subjects and answer questions. His team of experts came in one day a week to present various topics and products. These weekly demonstrations developed into an online "show" that consisted of 5-10 minute videos, very similar to daytime television show segments, that covered a wide range of topics. Everything was recorded and uploaded to the store’s website and YouTube channel. Gene’s team also went on the road with a camera crew to visit local suppliers, giving customers a chance to see where their groceries come from. The team became regulars on local television, adding a compelling public relations component to the branding program. These personalities were used to create guides for shoppers, covering topics like “ten ways to cut down veggie prep time” and “the nutritional benefits of beef.” Eventually, these guides were collected into an ebook, available on the store’s website. This book could be downloaded into a smart phone for easy access while shopping, minimizing printing costs and making these experts part of the shopping experience, regardless of whether or not they were in the store. Every brand and every product has a story. For some, this story provides a wonderful way to differentiate a brand. When a brand comes from a long tradition or has evolved over many decades, the brand story may be helped by history. But newer brands have stories too. The unique way that products are made or designed can separate one product from another in profound ways. People love stories; brands that provide them can capture a unique place in the mind. Most of us know something about the story of Hershey chocolate. We know there's a town in Pennsylvania that bears this name, and that the town has been home to the Hershey factory for many years. People may know that more than one billion Hershey bars were given to GIs in WWII. Even without knowing all the details, these facts establish a feeling of tradition and root the brand in the history of America. These products aren’t just candy bars, they are part of our national heritage — a story that differentiates them in the minds of consumers. The story of Ford Motor Company is also the story of the industrial age. Most people know what a “Model T” is and many associate the history of the assembly line with the brand. Ford designed the first moving assembly line and was able to produce a new car in one-eighth the time — a mere 93 minutes. This allowed the company to reduce prices enough to offer automobiles to the middle class. As a result, Ford still holds a place in the mind as the creator of quality, affordable cars. The story of this brand is still one of its defining characteristics. But stories don’t have to be long or even true — fictional stories work in the same way. Blue Bell Creameries has created stories about the cows of Brenham, Texas in its advertising to give viewers a taste of the company behind the products. Chanel created short films to tell stories about the brand and Duracell did the same for batteries. Stories like these engage the mind and add a dimension to even the most mundane products. They allow us to become part of a bigger picture, and help build a rationale for our purchases. So what’s your story? What can we learn from you? How does your company impact the lives of your employees, vendors and customers? What traditions do you represent? Where does your brand fit into the wider narrative? In a world of mass-produced, inexpensive homes and furnishings, the complex, work-intensive customs of Japanese carpentry may seem antiquated and impractical. But this also creates the appeal — for those seeking finely crafted, custom furniture, these perfectly designed and meticulously assembled pieces are the pinnacle of woodworking artistry. John had worked for cabinet makers and furniture designers for many years, but he was frustrated by the lack of care and design that he saw in the industry. He wanted to work with the wood, seeing it as a product itself, not merely an ingredient. When he opened his own furniture design and manufacturing shop, he needed a way to separate his offering in the minds of his customers. The techniques he learned studying traditional Japanese carpentry provided the story he needed to present his offering and differentiate himself from his competitors. This manufacturing process is far more labor-intensive and, of course, far more costly. John knew that, in order to recruit customers, he would need to create a much stronger emotional rationale — price would never be a competitive advantage. He decided to create these motivations by telling stories. At the entrance to his store he erected a series of wood panels covered in illustrations and text describing the history of the craft and the techniques used in the manufacture of his pieces. He showed how each piece was designed and the wood was planed with amazing precision, onion-skin thin layers at a time. He also created an “earthquake machine” — a small platform that could be shaken and bounced using metal dowels — to show how pieces created using these complex joints were much more durable than those made with screws and nails. The panels next to the machine included images of temples in Japan — built without a single nail — that have stood for centuries and survived many earthquakes. He provided a video on his website that gives an intimate look into how the craft has evolved, and how these tools and approaches differ from those used in Western cultures. He used the same images and copy in brochures printed on thin, rough paper that unfolded into long strips, providing a timeline and narrative of the more than 1,000 years of the craft. On the reverse he included photos of some of his pieces. John also realized that the wood itself had a story. Each type of wood was selected for specific purposes, and each tree dictated how it should be used. Many trees were harvested individually. These details were written up and attached to each piece — a keepsake for the customer that clearly presented the unique story of each chair, table and cabinet. John cut thin ribbons of wood using traditional Japanese planes and sliced them into small pieces, then had his logo and URL burned into them so he could use them as business cards. He was also able to make small note cards using the same process, which he used to send personal letters of gratitude to his customers. We all engage in rituals. As we bathe and dress, eat and work, we develop small, regular patterns that, over time, become habits that define our lives. Products and services are, of course, part of these rituals. You may have a certain suite of hair and makeup products that you use each day. You may arrange each Tuesday around the arrival of someone that cleans your home. You may always buy the same pizza on Friday poker nights or use some of your favorite salad dressing on “meatless Wednesday.” We may not think of these routines as rituals, but it's in these small ways that products and services become intrinsically intertwined with the daily motions of our lives. Companies have tried hundreds of ways to create these rituals. If you remove one side of a chocolate sandwich cookie and eat the creamy center before you munch on the delicious, crunchy exterior, advertising may have taught you how. Beauty brands create rituals by encouraging us to use moisturizer at night or recommending the best way to apply foundation. From bronzer to beard oil, concealer to cologne, these companies have developed practices that turn their products into daily routines. What ritual can you create for your brand? Will doing things in a new way help your customers? Can your products find a way into our daily habits? Will creating a new habit differentiate you from your competitors? Freddy was more than familiar with the habits that lead to financial security. Over many years of working with clients, he found that those who made financial planning a small but regular part of their routines were far more likely to retire comfortably, recover from accidents or other setbacks, and provide their children with a good quality of life. For this reason, Freddy thought of himself as a kind of personal trainer — one that focused on financial rather than physical health. In the same way that exercise must be done regularly for it to be effective, he knew that attention to financial details must become a repeatable event. He also knew that, for many of his clients, long discussions about saving would usually fall on deaf ears. Too often, conversations about money initiated fights among family members. If only, somehow, he could make it more enjoyable…. But how could he encourage habits? Could he make financial planning fun? Freddy made the attempt — he decided to build his brand by creating "games" that his clients could incorporate into their regular routines. Lots of kids get paid for their chores, so why can't this practice be extended to the whole family? The game was simple: a family would sit down at the beginning of the week and put together a list of chores for each person to complete. Freddy created some self-sealing envelopes with his name and logo on one side and a place to list chores on the other. A set amount of cash was placed in each one, and all the filled envelopes were hung in a conspicuous place in the house — a bulletin board or the refrigerator. As each person completed their chores, they would check them off. A separate envelope held an additional bonus that was given to the person who finished their chores first. To further their financial goals, Freddy also created a chore list for adults that included some of the more common (and difficult) tasks — putting together a will, budgeting, creating medical power of attorney documents, and so on. Freddy himself would pay clients a small bonus each time they completed one of these tasks. This set of games helped create a “work hard, get a reward” mindset for both parents and children. Even though the payouts were small, sometimes the act of earning an extra $50 or $100 was enough to get parents to complete tasks that they had put off for far too long. Freddy benefited by branding himself through the process, establishing himself as a coach who could help clients achieve their goals rather than a nagging consultant always admonishing them to do the right thing. Of course, his business benefited as customers began paying more attention to the financial planning services he offered. I Want A Tip Jar! We all have needs, but we all have wants as well — items that we don’t have to have, but that we really, really desire. (Due largely to the efforts of creative marketers, of course.) Freddy decided to take advantage of these feelings by creating family “tip jars.” He purchased several hundred ceramic piggy banks and had his logo and URL screen printed on one side. Each member of the family was given a bank and their names were written on the other side, along with the item the collected money would be used for — an Xbox or leather jacket, for example. Through family discussion, each member of the family was allotted a small amount of money for doing something positive. Unlike a “swear jar” where money is deposited as a punishment for doing something negative, these “tip jars” were a way to reward good or useful acts. Timmy might be given a dime each time he says something nice to his sister or for each day his room passes inspection. Dad might earn a dollar each time he calls his own mother or five dollars for each week he avoids getting another speeding ticket. Each tip-worthy deed was recorded on a whiteboard next to the tip jars, and a running tally kept of the amounts in each. When the banks were full, they were smashed and the contents handed over. Freddy benefited from the positive associations he made in the minds of his clients as he helped them practice saving. Although there was no direct financial benefit to his company, he was able to firmly establish his brand in the minds of his clients and demonstrate that he is more interested in a family’s financial well-being than on making a quick commission. The Game of "Living In Our Means"
Some of the most difficult conversations revolve around the topic of money. Failure to earn a good salary creates feelings of shame and regret; lack of money can be a source of anger and envy. Parents may be reluctant to talk about money with their children even though those conversations can be highly educational. To encourage family planning and communication, Freddy created a weekly "financial roundtable" game for his clients. Taking cues from some of the board games of his childhood — Life and Monopoly — Freddy produced (branded!) cards in several colors, one set for clothing and appearance, another for housing and utilities, another for food and entertainment — all of the typical categories of daily expenses. On each card he listed dozens of ways for typical families to save money, everything from turning off faucets and lights to making meals at home. Each week someone takes the role of “family CFO.” The CFO is in charge of picking a card and tasking every member of the family with finding ways to save money in that area. For example, if “food” is the topic for the week, each person has to describe a way he or she will save money on meals and snacks. Mom might promise to forgo her daily latte habit and save $20. Dad might pledge to take lunch to work on at least two days and save $30. At the end of the week, each person reveals how well they met their goal. A winner is chosen to receive a small cash prize. The meetings serve to teach children about how to use and manage money, and as a way to keep communication channels open between parents. It also puts every member of the family on an equal footing so everyone feels valued. No game was appropriate for every family, and Freddy customized things a bit for different clients. But the approach was always the same — give clients something to do for themselves that is entertaining and makes everyone feel included in the financial planning puzzle. These regular rituals had the benefit of keeping Freddy and his company present in the minds of his clients, while demonstrating his concern with their well-being. For a long time, products and services themselves were sufficient. But today, the rise of competition has fundamentally altered the marketplace. As innumerable products and services vie for our attention and our custom, novel experiences have emerged as one of the primary ways for brands to differentiate themselves. Waiting for your car to be repaired? Step into our wifi-equipped waiting room where an attendant is baking fresh cookies. Picking up some milk and a dozen eggs? Wander through the aisles as we tempt you with kiosks offering samples of our latest products. Getting your teeth fixed? We’ll give you a back rub and let you catch up on your favorite Netflix shows. These additional experiences have a profound cognitive impact, and can quickly become a topic of conversation, generating highly prized word-of-mouth recommendations. But experiences can be much more than simple add-ons; some businesses build their brands on physical and emotional experiences. Walt Disney Parks and Resorts is known for offering the most comprehensive vacation experiences, with no detail left unattended. Build-A-Bear created a brand out of the experience of crafting stuffed animals. iPic has transformed movie theaters into lounges with full-service bars and upscale food, turning a night of popcorn and soda into an evening event. The video game industry is being transformed as a new generation of virtual reality experiences become available from companies like Oculus Rift. If your brand can be part of a sensual or emotional experience, you may be able to create a significant point of differentiation in the mind of your customers. Getting to a destination can take a day. Add another day to travel home, and you've used up two vacation days before you even begin enjoying yourself. With the hectic pace of modern life, some people can only take a couple of days off before they have to get back to work. For these folks, Stephanie provided a wide range of comprehensive vacation-type experiences that transformed local venues into extraordinary weekends. For those who reminisce fondly about frat houses and football games, Stephanie created weekend packages to recreate days of youth gone by. On home-game weekends she rented an entire bed and breakfast and festooned it with pennants and tacky party decorations. Beer and wine were liberally provided (upscale versions of the swill we used to drink in college — some things are better left in the past) and raucous music played until the wee hours. In the morning, breakfast was provided and then everyone was herded onto chauffeured buses and transported to a specially designated tailgate party set up in the stadium parking lot. Tickets to the game were included as part of the package. When the game was over, guests were returned to the bed and breakfast to sleep off the effects of the long party. We’ve all felt the need to flee; to run away from our problems and start a new life. Stephanie decided to create an experience for staycationers who want to escape into a completely new identity — at least for a few hours. After arriving at a hotel ballroom reserved for the event, guests were paired with clowns who taught them how to paint their faces. Then they were provided with costumes and props — everything from squirting flowers to glitter guns. The entire troupe was then driven by “clown car” to a nearby hospital where they visited children staying in the pediatric wing. Afterwards, guests were returned to the hotel where they changed back into street clothes. That evening, a four-course dinner was served in the round while acrobats performed feats of flexibility and strength. Guests were able to watch the performance up close and learn how these remarkable athletes train and master their skills. After a good night’s sleep, guests were provided the opportunity to train with trapeze artists at a nearby gym. Stephanie partnered with a nearby university to create a series of tours of various labs engaged in all sorts of cutting-edge research. First, guests were shown the latest advances in robotics and nanotechnology and given a brief lecture on how these programs might change everything from medicine to manufacturing. As part of this exhibit, guests were allowed to “talk” to one of the prototypes to understand how scientists are learning to program the nuances of human speech. Lunch was served in the chemistry department. A local chef — a specialist in molecular gastronomy — was brought in to show off his skills and explain how each course was the product of both chemistry and artistry, and how the senses of taste and smell could work together to create a profound sensory experience derived from elements found in nature. An afternoon in the physics department explored the dimensions of time and space that most of us fail to understand. Some cutting-edge experiments in quantum mechanics were described by university professors and their ramifications explained by scientists working in the university’s quantum computing department. Guests then went to the planetarium to watch a program on astrophysics. By this time, evening had arrived and the entire party moved outside to enjoy wine and fine food on picnic blankets spread out around the quad. University musicians serenaded the group while dinner was served. The university benefited from the increased exposure, and attendees were encouraged to donate if they felt so inclined.